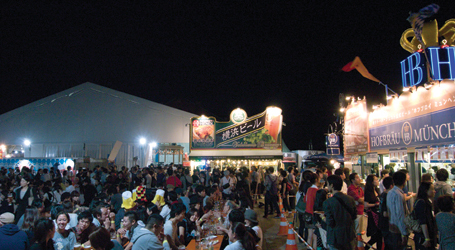 Yokohama is home to one of Japan's largest beer festivals, the Oktoberfest at Akarenga. Last year's festival, spanning 17 days, attracted roughly 140,000 guests! The event features over 80 total beers, about half of them regional beers in the spirit of the German festival. For thirsty guests that want to explore the full range of options, other delicious German beers and Japanese craft beers brewed in German styles are also available. Beer is hardly the sole feature of this lively festival. Authentic German food, not the least of which includes sausages, offers guests endless pairing opportunities. A German band meanwhile plays Oktoberfest tunes to elevate the festive mood. Previously, the event has been held in tents whose interior looks like German Oktoberfest, but this year the tents will feature Oktoberfest scenes on both the inside and the outside. The organizers say that their goal is to enrich Yokohama culture. Beer is of course an important part of Yokohama, but they are thinking even further. There should be a sense of unity, as in Germany where people of all walks of life come together at the festival to celebrate. It's not like an izakaya where groups sit at separate tables and pay little attention to the party beside you. Here, you're encouraged to clink glasses with those around you and enjoy beer in a more open setting. Make new friends. Spread that drinking culture.